Usually Garmin announces its latest compact nüvi GPS devices for around $1000, but the company's just announced three version of its 200 series that cost a lot less than that without sacrificing too much. Each has a 3.5-inch touchscreen and turn-by-turn voice-prompted directions, and are differentiated by the amount of NAVTEQ map data installed. The nüvi 200 ($400) has maps of the contiguous United States, while the nüvi 250 ($500) adds Alaska and Hawaii, Canada and Puerto Rico to that range. Europeans and world travelers will be interested in the nüvi 270 ($600) with its mapping data of over 30 countries in Europe as well as all the maps of the other 200 series units. What's lacking at this lower price? These pocket-sized slim GPS units don't have that widescreen or MP3-playing capability of their more-capable brandmates, but that might be a small sacrifice for this new price point. They don't look half bad, either. 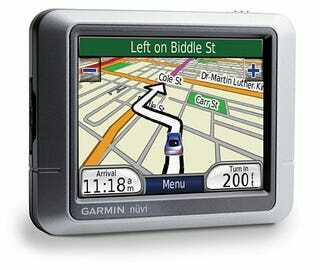 Garmin didn't say yet when these would be released. Hit the gallery below for a good look at these easy-to-use GPS devices.